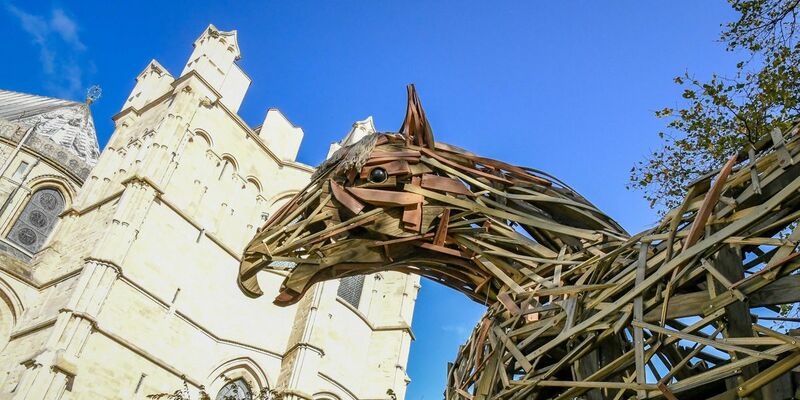 The magnificent Canterbury War Horse (pictured above) is already in place and at 20 feet tall, its wooden frame is a dominating presence at the eastern end of the Cathedral Precincts. Under the leadership of sculptor Clive Soord, the horse has been built by the students and staff of Canterbury College with support from local businesses. During half term week, students joined families visiting the Cathedral to make poppies out of recycled plastic bottles. These were then fixed to netting and spread out below the towering installation which serves to remind the observer that alongside the horrific human cost, eight million horses died during the First World War and many travelled through Kent on their way to the continent. Already nicknamed Joey (like the horse in Michael Morpurgo’s classic novel), the horse will watch over a Field of Remembrance to be created by the Royal British Legion on the grassed area nearby. 531 miniature wooden crosses will be placed in the ground, each one bearing the name of one of the fallen from the First World War whose name also appears on the Buttermarket Cross outside the Cathedral’s Christ Church Gate. On Friday 2 November at 11.30am, there will be a short service of dedication for the field led by the Dean of Canterbury, the Very Revd Robert Willis. Kent choir, Cantores Dominicae from Lyminge, will be marking the centenary on November 10 and 11 with a special weekend of choral events in the Cathedral focusing on Remembrance and Reconciliation. Joining Cantores Dominicae will be a German choir Heinrich-Schütz-Kantorei from Kiel, The Oyster Singers from Whitstable and The Canterbury Singers. The weekend will start with a short lunchtime concert performed by Cantores Dominicae and Heinrich-Schütz-Kantorei at noon on Saturday (10 November). The programme will include movements from Brahms’ German Requiem. On Remembrance Sunday, November 11 at 6.15pm, the community of four choirs will perform a special evening service in the Cathedral entitled Remembrance & Reconciliation composed by Adrian Bawtree, one of the Cathedral organists. More than 200 musicians from Britain and Germany will be taking part in this unique performance. An exhibition by the Cathedral’s artist in residence, Dawn Cole, is underway in the Cathedral’s Chapter House. Remember Me?! is an installation created by the Thanet-based artist following research in the Cathedral Archives. In particular Dawn was inspired by the Cathedral’s War Work Depot, through which were made many items for the war effort including pillowcases and sandbags. Dawn has made 100 plaster castings of the folded hand embroidered pillowcases and these have been laid out in reference to the Commonwealth War Graves at Wimereux Communal Cemetery in France. At the end of each row is a screen printed image that on close inspection is made from thousands of poppies. This exhibition of ten glass installations made by Philip Baldwin and Monica Guggisberg has been in the Cathedral since May. Of particular significance at this time is the Boat of Remembrance – 100 clear glass amphorae which have been suspended in the shape of a ship from the safety deck currently constructed in the Cathedral’s Nave as part of the ongoing restoration work. They each mark a year of remembrance since 1918. On Remembrance Sunday there will be an early awakening as a piper is due to play a five minute lament on the bagpipes as part of the national Battle’s Over – a Nation’s Tribute at 6am. Later in the morning wreaths will be laid in the Buttermarket at 10.25am followed by the Civic Service of Remembrance in the Cathedral at 10.45am. After the service Cathedral bell ringers are due to join a nationwide ringing of bells at 12.30pm to coincide with the march past at the Cenotaph in London.